According to the THINK! Cycling Campaign, the number of cyclists seriously injured has increased in recent years, faster than the increase in cyclists on the roads. It is important to make sure you have a full understanding of the Highway Code and know how to keep yourself safe. Below we have outlined some of the key rules from the Highway Code for cyclists to follow. Section 59 of the Highway Code explains the appropriate clothing cyclists should wear in order to make it easier for other road users to spot them and help to keep them protected in the case of a collision. Helmet – Your cycle helmet should conform to the current regulations, be the correct size for your head and be securely fastened. Reflective accessories – Strips on the helmet, as well as armbands and ankle bands will help you be seen in the dark. This section of the Highway Code is all about cyclists’ lights and reflectors. At night cyclists must have their white front and red rear lights lit. Their bicycles must also be fitted with a red rear reflector and amber pedal reflectors. White front reflectors and spoke reflectors can also increase your visibility to other road users. Flashing lights are permitted but cyclists riding in areas without street lighting should use a steady front lamp instead. Cyclists should use dedicated cycle lanes and routes wherever possible. Section 61 covers cycle routes and other facilities for cyclists. If cycle routes are available cyclists should make use of them, as they can make their journeys safer. Cyclists should also use advanced stop lines, cycle boxes and toucan crossings, unless it is unsafe to do so. Section 62 covers the use of cycle tracks, which can be used to make a journey safer. Cycle tracks are usually located away from the road, but are sometimes found alongside footpaths and pavements. Sometimes cycle tracks will have a separate path for pedestrians, however this is not always the case. If you are using a segregated path, it is important to make sure you stay on the right side of the track to avoid colliding with pedestrians. Be on high alert in case pedestrians pass into your lane without realising. If you are sharing a path, take extra care and give plenty of room to children, the elderly and disabled people. You should always be riding at a speed that would allow you to slow down and stop if necessary. Cycle lanes are marked by a white line (which may be broken) and are found alongside the carriageway. Although not compulsory, you should use the lanes whenever practical as they can make your journey safer. 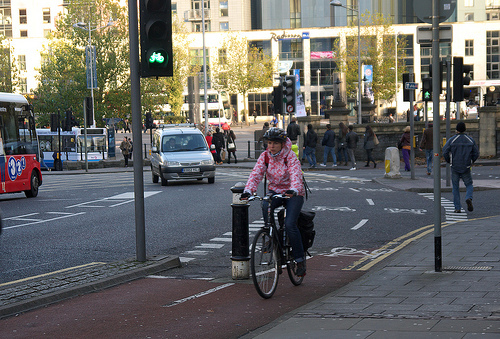 If you need to leave the cycle lane, always check that it is safe to do so and signal to other road users. Something that confuses many cyclists is whether or not they are allowed to cycle on the pavement. According to Laws HA 1835 section 72 & RSA 1984, section 129, cyclists must not cycle on the pavement. Cyclists can use bus lanes when permitted to by road signs. Take extra care and watch out for people getting on or off buses. Only overtake a bus pulling into a bus lane if it is safe to do so. Do not pass between the kerb and a bus when it is at a stop. This section explains what cyclists should and should not do when riding on the road. Be considerate of other road users, taking extra care around blind and partially sighted pedestrians. Use your bell when necessary to signal you are nearby. Ride more than two abreast. Ride close behind another vehicle. Carry anything that will affect your balance or get tangled up in your wheels or chain. Look all around to ensure it is safe to move away from the kerb, turn corners or manoeuvre your bicycle. Always use a clear signal to indicate your intentions to other road users. Keep an eye out for obstructions in the road to prevent you from having to swerve to avoid them. Leave plenty of room when passing parked vehicles and watch out for pedestrians stepping into your path. Take care when overtaking other road users. Cyclists should not carry a passenger on their bicycle, unless it has been build to carry one. They must not ride in a dangerous, careless or inconsiderate manner. Cyclists must not ride under the influence of alcohol or drugs (including some medications). Traffic signs and traffic light signals apply to all road users. Cyclists must obey them. Just as there are parking rules for vehicles, there are also ones for cyclists. You should always aim to use cycle stands of cycle parking facilities wherever possible and avoid leaving your bike where it would cause an obstruction or hazard to others. A red traffic light applies to all road users. Cyclists must not cross the stop line if the traffic lights are red. Use the separate stop line for cyclists when practical.